As the largest and likely most important purchase you'll ever make, home ownership requires careful budgeting. This includes planning not only for a down payment and a monthly mortgage, but also taxes, repairs, and other costs through the life of the home. You'll have to hire at least one inspector and appraiser before making an offer, then be prepared to pay 2-4% of your mortgage in closing costs. After the move, you’ll have to pay property taxes, which can rise over time. You'll also need insurance, possibly a homeowners association membership, and certainly utilities. Budgeting for routine maintenance and repairs is also prudent. Even with these costs, when making a "smart" purchase with the help of an outstanding real estate professional, homeownership is often a sound financial investment. To learn more about how to prepare, contact me for a private consultation. Working with a real estate agent is essential to getting the best price on your home, but that's not the only professional you'll want to find. Many home buyers find it useful to talk to several mortgage brokers to ensure they get the fairest rate and payment plan. If you're planning significant renovations, a contractor that you trust can help keep your improvement dreams alive. Even if you want the home as is, you’ll need an inspector and appraiser to give you an assessment of the true value and hazards of the home. Finally, to guide you through the paperwork, you may need a real estate lawyer, which many states now require by law. When you're ready to start building those connections, reach out to me for a private consultation. When buying a home, you don't always think about the selling it. Yet a typical home buyer will stay put for a little over ten years, then move on to greener pastures. What your once-new home will be worth at that point depends on its location, structure, and condition, among other things. Ideally, the home will be situated in a quiet, peaceful neighborhood, yet be close to roads, shopping, schools, and other attractions. Inside, the layout and structure are key. More bedrooms mean more value, as well as additions and amenities desired in your geographic area, like pools, enclosed porches or patios, etc. High quality construction materials can keep it as good as new with only minimal maintenance while you own the home. Contact me to discuss a potential home's value to you and to your future buyers. You may not be a true home flipper, but you may be willing to invest a little TLC into a needy home. This could be a great money saving idea or a huge mistake. If the changes are superficial, such as repainting and even retiling, a motivated buyer can be successful. If electrical or foundation repairs are needed, that’s likely best left to the professionals. Be realistic about the amount of time you can invest and when you want to have the redone areas of your home ready for use. A home inspection can reveal fairly accurately how much you'll need to change to have your dream home, so plan on fixing all the problems the inspection turns up before embarking on a large upgrade. Contact me for a private consultation to estimate what you can invest both in money and time. When there's a chance of snow and chilly weather, fewer buyers are touring homes, meaning home sellers are often more apt to close at a lower price. Take advantage of the time with careful home evaluation. As you walk through a home, listen for the sound of the heating system. If it turns on several times during your tour, the home is likely losing heat, indicating poor insulation or drafty doors and windows. You also can, and should, ask to see recent utility bills to get a sense of how much it will cost to keep your family comfortable during the chilliest months. Drive through the neighborhood the day after it snows to get a sense of how quickly the roads are plowed and driveways shoveled. For more ideas on what to look for, contact me for a private consultation. In many areas, homes are spending only two weeks on the market before being swept up by an interested buyer. It's time to act fast, but not hastily. Before you begin to look at homes, talk to a mortgage broker about getting preapproved for a loan. When you find the home you want, you can make a reasonable offer without waiting on the bank. Skip low-ball offers completely, as these will be dismissed compared to the other quick offers. As much as possible, try to look past cosmetic defects in a home. Landscaping and a new coat of paint are easy beauty fixes. Contact me so that I can keep an eye on MLS listings, letting you know about new properties you may be interested in before they are even posted on public sites. Damaging your credit worthiness is easier than most people imagine. Before you apply for a home loan, you've likely worked on increasing your credit score, but after you are pre-approved for a loan, a bank can still revoke their offer. This means things like buying a car or furniture on credit can cost you a home deal. Anything that increases the amount you owe puts your potential loan in jeopardy, including co-signing on someone else's loan. Banks also look carefully at your accounts, so unusual deposits or withdrawals are red flags that indicate you may not be as financially reliable as they thought. Similarly, job changes are dangerous, so work to close your new home deal before making any major changes. For more tips, contact me for a private consultation. When you buy a new home, you're purchasing more than the plot of land and house. You're also buying into the community surrounding your home. Before choosing an area, step back and evaluate what you value. Do you want to be near local nightlife? Parks and family oriented places? How far are you willing to commute? Do you want neighborhood parties or neighbors that leave you alone? When you’ve found a likely home, talk to the neighbors to see what the area's really like. Look up crime statistics. Visit the neighborhood at different times, including during the day, the evening, and at rush hour. You may find your little oasis has some hidden faults. Contact me for a private consultation and an in depth look into different local neighborhoods. Buying a home is an emotional and anxiety ridden process. Even after finding a home and making an offer, you'll worriedly wait by the phone for the seller's response. Ready to take some of the stress out? Start by scheduling a private consultation with me. Rather than having you wait in the dark, we'll talk through what the home buying process entails and what reasonable timelines for each step are. Knowing what is happening behind the scenes will help calm your nerves. While the seller considers, you can focus on other things like packing your home or just spending time with the family. Or you can opt to strategize for various outcomes. We can decide what our immediate response will be to each of the seller’s possible actions. That way, the lag time is minimized. Contact me to start the process and get answers to those nagging questions. When you put your home on the market, getting an offer can be easier than finding a house you'd like to purchase. This can put you in the position of nearly having your home sold without a new place for your family to go. One way to avoid this is to research new homes before putting yours on the market. You can get all your research together so when the time comes, you can make informed decisions quickly. If your home is already getting offers, consider accepting one with a longer timeline for closing or making the acceptance contingent upon you finding a new home. In extreme cases, you can even rent your home from the buyer until you're ready to move. Contact me to discuss what timelines are best for your situation so you can enjoy a smooth transition. As you prepare your home for buyers, you need to help them envision their family living in the space that your family loves. Though it can be hard, it's important to remove a lot of the uniqueness your family brings. Store those beloved family photos until it's time to unpack your new home. While lively wallpaper and paint colors may be perfect for your family, replace them with neutral tones for others. The last thing you want is a buyer passing on your home because they thought one room was "just too green." Upgrade to hide the years of use; new appliances, carpets, and countertops are all possibilities to get more interest and higher offers. Each home is different, so contact me for a personal consultation. Odors are tied to memories, people, and emotions. When you put your home on the market, you're encouraging strangers to walk through and not only look but also smell around. Most homes have some odor which can be neutral or even pleasant, but it's hard for someone who lives there to identify it. Ask a friend to walk through and describe what she smells in each room. Some rooms, especially those with pets, will need professional carpet cleaning or replacement along with deep furniture cleaning. When buyers are coming, bake something with strong, pleasant smells like chocolate cookies or cinnamon bread. To skip the baking, slice (and serve) pieces of citrus. Your buyers will love the aroma, and you’ll love the offers. When you're ready to start the process, contact me for an individual consultation. Did you know most home buyers make a decision about whether they like a home within 12 seconds of stepping out of their car? Curb appeal can make or break a sale. Invest time in all the lawn maintenance you’ve been putting off. In the summer, this means mowing and watering the lawn. In the winter, it means shoveling regularly and discarding broken branches and other debris. If you have a garden, spend some time weeding and beautifying the area. A new layer of mulch can make it look new. For a low maintenance option, create beautiful rock gardens. Anything that lets buyers enjoy the exterior will impress. Don’t forget to replace broken shutters and repaint as needed. Contact me for an individual consultation. Repainting your interior walls before putting your home on the market is a low cost way to increase the appeal and perceived value of the house. Choose a light, neutral color like brown, tan, or beige. Never paint the walls white as this is actually a harsh tone that makes rooms look smaller. To make your job easier, paint all the rooms the same color. You can paint the ceiling the same as well, but if it's a few shades lighter, it will pop more. In fact, the lighter color actually makes the ceiling look higher and the room bigger. If you have time to paint the rooms differently, opt for reds, oranges, or yellows in the kitchen, light yellows or tans in the bathroom, blues or browns in the bedroom, and darker browns in the home office. Each home is a little different, so contact me for an individual consultation. A bathroom that looks old and outdated can be a huge turnoff to a buyer. But you don't need to invest in a remodel to get buyers to invest in you. Replace the toilet and vanity if they look dingy, which can often be done for less than $500. Install white lights above the vanity and lay down a new bath rug that matches the new towels. Deep clean the tub and consider refinishing it for extra shine. If you can make the buyer feel as if she is walking into a spa, you're sure to impress. Get a new shower curtain and tie it back with ribbons. Light a few candles with peaceful scents and roll washcloths into a decorative pile beside the sink. It is amazing what a thorough cleaning and new linens can do to a bathroom. Contact me for an individual consultation and even more ideas. When your home goes on the market, the first thing buyers will look through is your online photographs. From there, they will usually decide whether it's a home they want to see in person... or not. Capturing your home's essence on camera is crucial. An investment in a professional photographer may pay off, but a good real estate professional can often get good photos without one. To get ideal photos, they may ask to minimize the amount of furniture so the shots enhance the size of the room. Positioning the camera in front of an expanse of floor rather than behind a piece of furniture or half wall also does the same. Shooting in natural light is best, but repositioning lamps if necessary to brighten corners with white light can add great impact. Aiming the flash at the ceiling when taking pictures also enhances photos; reflected light is more similar to sunlight. Your agent may want to try different angles and different times of the day, to find the most ideal shooting conditions. Contact me with questions regarding highlighting the best features of your home. In many homes, there is one space that doesn't seem to serve a purpose. The tiny room with slanted walls on the top floor or the teeny space below the stairs is often used for storage. If you can convert these areas to usable space, you have one more feature to add value to your home. If you can fit a comfy chair and install some shelves filled with books you've created a library. Add a chair and a computer to a closet with a waist high shelf and you have an office nook. Install wall shelves in any open corner in the bathroom to stylishly store linens. Every space has the potential to be a selling point. Contact me for an individual consultation to help your home reach its potential. When you have kids and a home for sale, maintaining a buyer friendly environment can be challenging. Give yourself one full day to declutter for every room in your home. After you've finished, put as many things in storage as possible, especially large children’s toys. Anything that you can do without for a few months should be gone. For things that are staying, create an organization system. Plastic storage bins that stack are perfect for accessing and stowing toys quickly. If you have a diaper changing station, work to make it as minimalistic as possible. Put the diapers, wipes, and other necessities in a nearby drawer so they're out of sight. Use baby blankets and stuffed animals to add color to the room, but again, less is more. Contact me for a personal consultation to help simplify this delicate procedure. 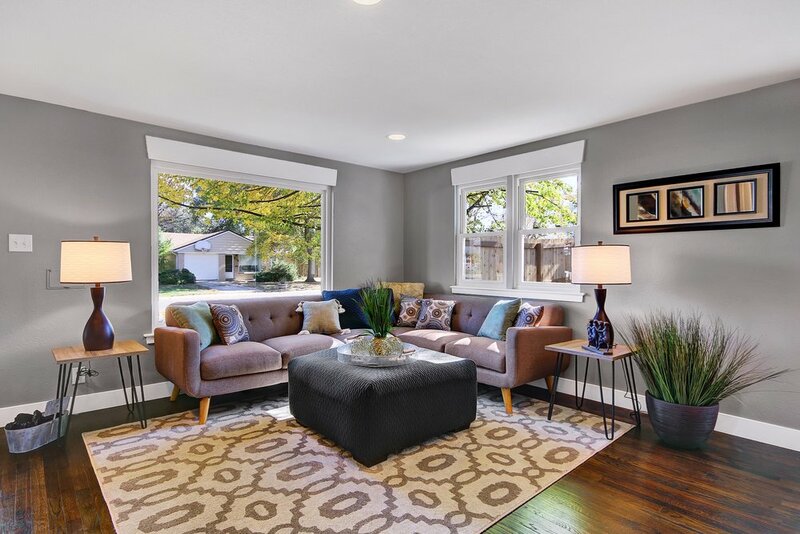 Lisa's Staging Tips - Where to start?